Juvenile ancient murrelet. Photo by Josh Silberg. As with other alcids, this small waterbird is often referred to as a 'flying football' due to its plump body shape. It has a black face, crown, throat, and nape of neck, with a grey back and wings. The white on its underparts extends to the sides of its neck. Breeding adults have white streaks on the nape and crown, and juveniles have a paler throat. The ancient murrelet gets to 25 cm long and has a small yellow bill. This species is not commonly sighted close to land as it mostly inhabits open ocean, straits, and sounds. It may come closer to shore when feeding, especially in areas where favourable tidal conditions bring food to the surface. It is found from California to Alaska in winter, and is a year-round resident in the northern half of the BC coast, part of the Alaska coast, and along the Aleutian Islands. It breeds and nests on islands and coastlines adjacent to the waters it inhabits year-round, including Haida Gwaii, Kodiak Island, and the Aleutian Islands. Click here for a range map. The ancient murrelet, particularly an immature individual, may be confused with a juvenile or winter adult marbled murrelet (Brachyramphus marmoratus) - both have similarly dark faces, heads, backs, and wings contrasting with light undersides. The marbled murrelet can be differentiated by a white collar which separates the dark crown and back, by a white scapular patch (more pronounced in the winter adult than the juvenile), and by a shorter dark bill. Winter and breeding adult ancient murrelets also have a pronounced dark throat, while the marbled murrelet has a white throat. 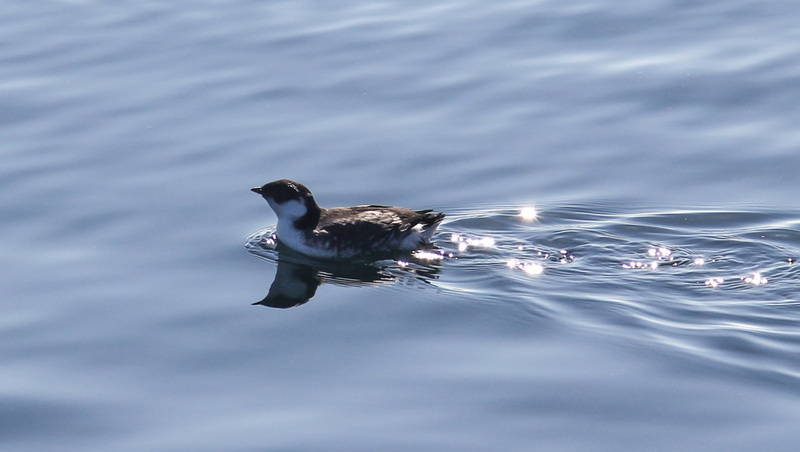 Unlike all other seabirds species, the ancient murrelet raises its young completely at sea. Parents take turns incubating their chicks, and lead their chicks to sea just a few days after the chicks hatch. The chicks are not fed until they reach the sea. Conservation: The ancient murrelet is common in some areas, but population levels have declined partly due to predation from intruduced foxes, raccoons, and rats on nesting habitat. It is a blue-listed species in BC, and is listed as a species of special concern by the Species At Rist Act. Other threats to this species include habitat degradation and oil exposure. See the 2004 COSEWIC Assessment and Update Status Report for more information. Dunn, J. L. and Alderfer, J. (Eds.). (2011). National Geographic Field Guide to the Birds of North America. (6th ed.). Washington, D.C.: National Geographic Society. Pp. 258-259. Ancient Murrelet. The Birds of North America Online (A. Poole, Ed.). Ithaca: Cornell Lab of Ornithology. Retrieved from the Birds of North America Online. Accessed 03/04/2014. Ancient Murrelet Synthliboramphus antiquus. Audubon birds. National Audubon Society. Accessed 03/04/2014.